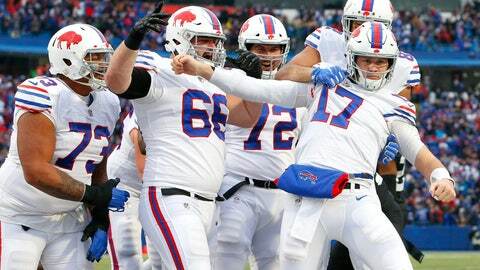 MIAMI (AP) — The season is heading in opposite directions for the Miami Dolphins and Buffalo Bills, which has brought them closer together in the AFC East standings. The Bills have a shot at only their second three-game winning streak since September 2011. They’ve gained more than 300 yards in each of the past two games after failing to do so in the first six. And they finished strong last week, scoring twice in the fourth quarter to beat Jacksonville 24-21. “For us to control our destiny, we have to win out,” running back Kenyan Drake said. The matchup of sub-.500 teams may lack luster, but Bills defensive tackle Jordan Phillips said he’s fired up about it. Released by the Dolphins during Week 5, he said the move to Buffalo turned around his career, and he’s eager to settle old scores against Miami. Allen’s counterpart, 30-year-old Ryan Tannehill, said he couldn’t offer any recollections regarding the challenges he faced as a rookie quarterback. “That was so long ago, I feel like I’m 90 compared to my rookie year,” Tannehill said with a laugh. A knack for takeaways has been the Dolphins’ strength. They rank second in the NFL with 17 interceptions, and cornerback Xavien Howard is tied for second in the league with five. Howard has nine interceptions in his past 16 games, the most of any player over that stretch. Miami’s Leonte Carroo will likely see significant playing time because of injuries to the receiving corps. Carroo, who began the season on the practice squad, said he received almost 300 congratulatory text messages after making a 74-yard touchdown catch against Indianapolis.